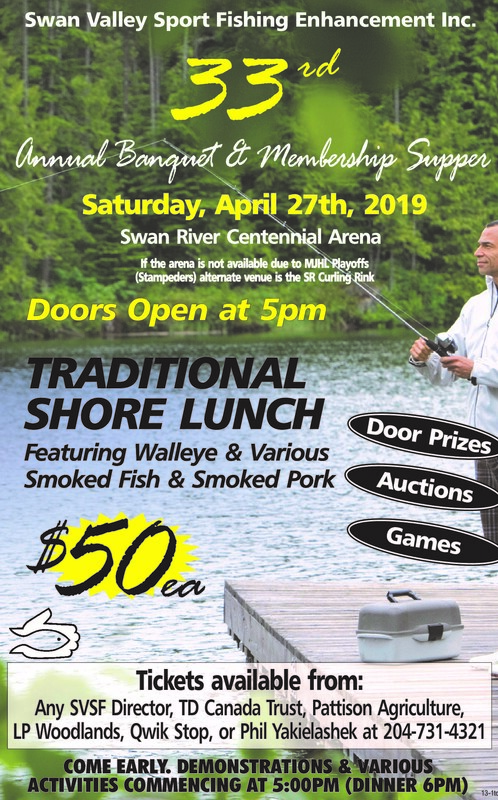 2019 Annual Banquet - Swan Valley Sport Fishing Enhancement Inc.
SVSFE’s annual banquet is just around the corner… April 27th, 2019! The banquet, commonly referred as “The Fish Supper” is where SVSFE hosts a great event to raise funds to enhance local angling opportunities in the Swan Valley area. Each year, community and non-community members attend the banquet to enjoy a shore-lunch style fish supper, play games, tell stories at the bar, visit various displays, bid on auction items, invest in various raffles, but most importantly – socialize and discuss the up-and-coming open-water angling season. This social gathering is fun for all ages, and always anticipated by all SVSFE directors and volunteers.